When we first bought Mary’s CBF500 it came with heated grips fitted, but they were installed with no relay so all to easy to leave on when parking up. After Mary had flattened her battery twice in this manner this week, I promised to wire them up properly with a relay to cut the power when the bike’s ignition is off. However, the heated grips aren’t the only accessory wired in, we have a satnav, USB sockets and probably more gadgets in the future. So, to help simplify stuff, I opted for a secondary fuse / distribution box. Tapping the rear number plate live is a good choice in case the new circuit causes a short, loosing the number plate light won’t prevent us riding. 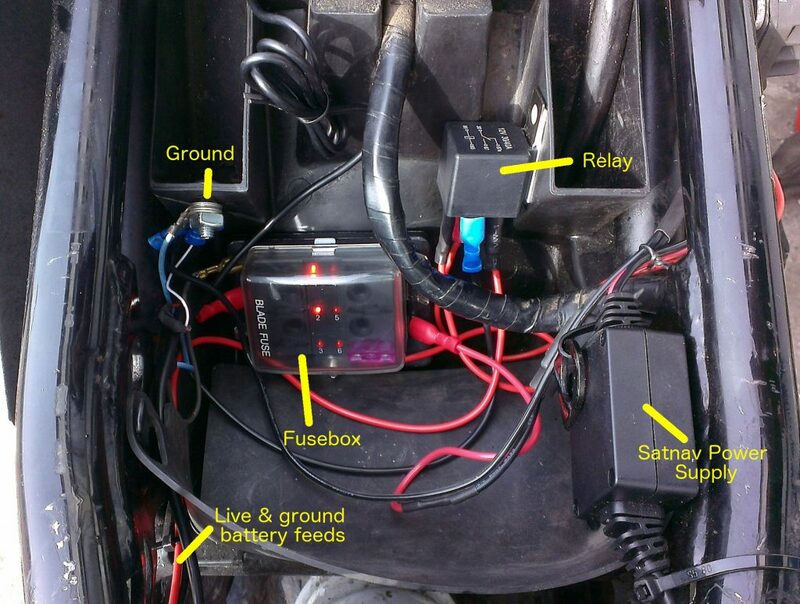 A mate happened to have a basic Mictuning 6-way fuse box going spare – perfect for the job. My plan was to tap a switched live feed from the rear number plate light circuit, which would trigger a relay, to feed this fuse box and in turn all of the bike’s gadgets. Tapping the rear number plate live is a good choice in case the new circuit causes a short for any reason, loosing the number plate light is no big loss and won’t prevent us riding. On the CBF500 this light is connected by some bullet connectors behind the rear right hand fairing panel. I opted to strip back the insulation and solder on a feed, rather than using a Scotch lock which have a reputation of failing. The final join was covered in heat shrink wrap and waterproofed with amalgamating tape. The relay is essential a switch which is turned on or off when it receives a live feed. This avoids the need to tap into an existing circuit on the bike to power our gadgets, potentially overloading it, or causing it to fail if our gadget has a fault. With the relay, we can take a dedicated (and fused) feed from the battery live, which is turned on/off as and when our number plate light it illuminated. You just need a standard 12V automotive relay with 4 or 5 pins (only 4 will be used), usually just a couple of quid on eBay. The relay’s output then feeds the fuse box where each gadget can have it’s own fuse and output. The Mictuning fusebox takes six standard blade fuses (though a 10-way box is also available), each with an LED light which illuminates to indicate a blown fuse. The CBF500 has plenty of space under the seat to accommodate the box (which is 85x63x35.5mm) and relay, which I simply secured with decent double sided tape. Once in place it’s just a case of connecting each gadget to one of the six fuse box outputs and a common ground, with standard crimp connectors available cheap on Amazon. I had no handy ground bolt nearby, so brought over one from the battery adjacent, to this each gadget and the relay was attached (black and blue wires in above photo). In use the setup works a treat, cutting the power to all gadgets when the ignition is turned off. It’s worth noting that the fuse box LED circuit does leak some current with no fuse in place, enough to power the USB sockets, but not enough to power the heated grips. Wiring is not super difficult, just needs some care and patience. The hardest part was soldering the splice into the number plate light live.